Back in 2013, Mantic Games was releasing Mars Attacks on Kickstarter. In the box, elements of terrain were also provided, bringing this 2 players game to life in a way only the movie could compete with. And when fighting your way against a cunning cat – picture attached – , you always need to find cover behind a wall or a bin. 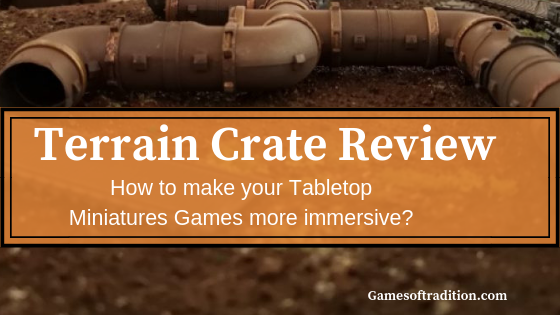 In April 2017, Mantic games launched Terrain Crate on Kickstarter – the promise of a set of terrain elements that will adapt to most 28mm fantasy miniature games. 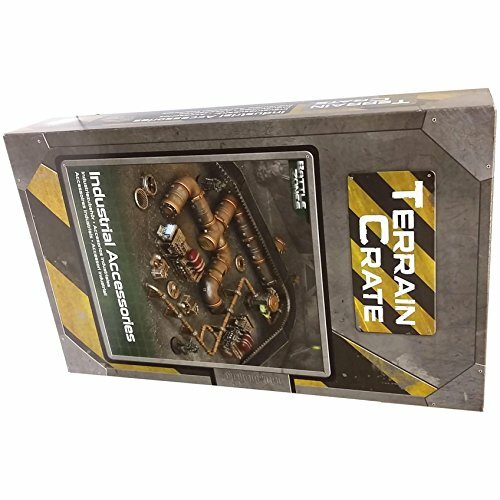 And on May the 4th, they announced products part of a sci-fi crate. 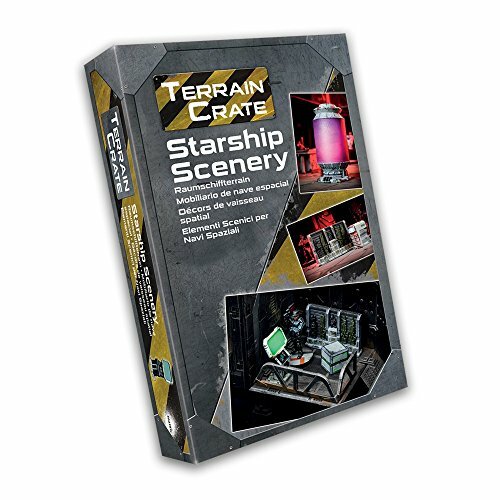 A year later, Terrain Crate contains a full set of Sci-Fi themed terrains. 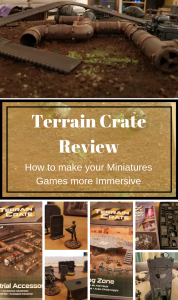 Let’s have a look at some of those products in this terrain Crate Review. 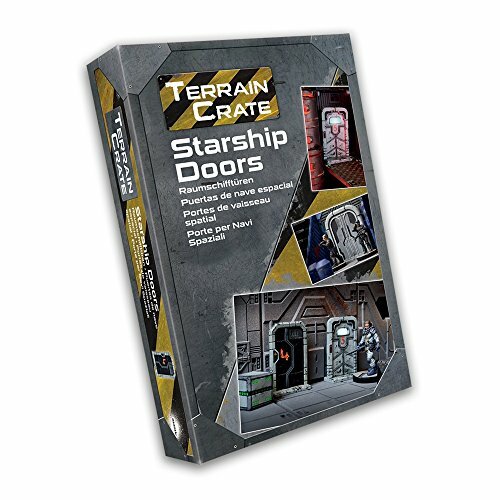 Mantic games starship doors pack will allow you to get 20 doors of 5 different types to place in you sci-fi themed games. The doors come unpainted, and the quality is really good for the price tag. The scale fits perfectly 28mm games – as the Terminators (from Terminator Genisys, from River Horse) or the soldier (from Mars Attacks, from Mantic Games) show. Bigger models, such as the 35mm Batman from Knight Models would be too tall for those scenery details. Such doors will fit perfectly in games such as Alien vs Predator, from Prodos to separate different rooms on the spacecraft. This second set, the Starship Scenery, contains 26 pieces, unpainted as well. There again, made specifically for a range of 28mm to 30mm, this will fit your usual range of miniature games. Pictures below will show them versus the characters from Terminator or Mars Attacks. As you will see, some elements could still make their way in Bruce Wayne’s Bat Cave, using the miniatures from Knight Models, but you would notice the smaller size. 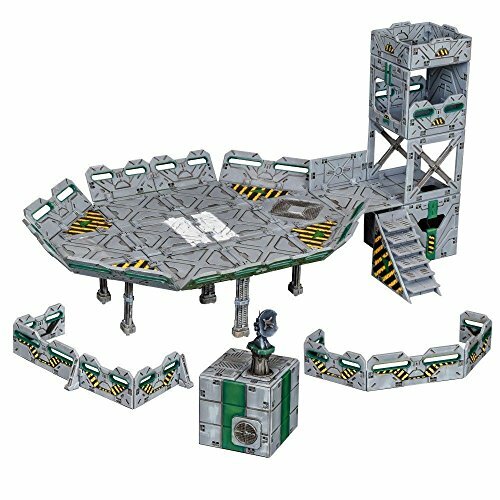 The set contains canteen tables, boxes, weapon racks and other monitors. You will find all the typical items you’d expect to see when crossing the universe in hostile environment. There again, the level of details will be enough for all the painters in you to spend a few hours coloring those elements before placing them on your table, but you will most likely to use boiling water to unbend some of them – the tables for example show considerable bending. The mold lines are also really noticeable – just like with your favorite minis, you will need to spend a bit of time cleaning the pieces before painting them. The industrial accessories set is not exactly part of the sci-fi set but will complement really well your table top. You will get on walk way, big pipes and smaller pipes, and a couple of generators, fans and other exhausts, all made to fit a scale from 28mm to 30mm. Just like with the products above, the set comes unpainted, and will require a bit of trimming before you actually go on painting it. Don’t throw your box straight after opening it, it contains 2 Mantic points you may use to redeem some goodies on Mantic Games’ website. The set comes with no guide as of how to set it up, but you will quickly get how to build your elements. It is modular, in the sense that you can shape it the way you like, and the clips system is very easy to use, but if you think you can escape from gluing the components, you’ll be wrong. No matter how careful I was, taking a few pictures of the set always ended up in elements falling. I cannot imagine playing this way. And at any rate, once painted, I will not try to move the components around, it’ll end up chipping the paint. Apart from this, in matter of a few minutes, you have a very scenic view on your table: any miniature games would benefit from it: I can already see Rick Grimes, from The Walking Dead, venture a system where zombies roam, or my marines fight an alien invasion. This is a highly recommended set for any beginner: it really looks nice, will be simple enough to prepare and paint and will fit most of the universe I can think of. The Landing Zone is the last box we will look at today. Just like the previous one, this piece comes non assembled, and unpainted. This set will get you 4 Mantic Points. When opening the box, you will find no less than 15 bags of elements – quite something to assemble. As for the industrial elements above, you will find no instructions: use your imagination. For this terrain as well, the promise of modular blocks is kept, but you’ll soon find yourself gluing the pieces. 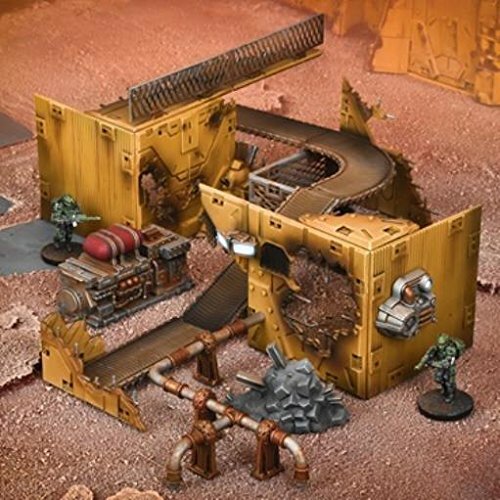 This will make building easier – some clips clip better than others, and getting the landing pad to stand may prove arduous – and in any case, once you paint the beast, it’s unlikely to look any good if you move the elements around. But by any rate, this is not impossible: you will find your own way, and keeping the elements unglued may also give you the flexibility to support the adventures or four heroes in different locations. Once built, the landing zone is a beauty: the pad is huge and will welcome big ships. I was unfortunate to have a mess up in the box – some elements are missing to build the small satellite post, and I have some guns hat should be present in another model from Terrain Crate. Still, this has not diminished my pleasure to prepare this building. And this issue was very promptly addressed when contacting Mantic Games support: this is really pleasing to know that a company responds to their customers’ questions and issues. Now, time is to paint it and get some alien action ! 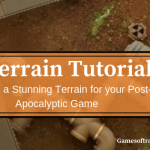 With the Terrain Crate series, Mantic Games offers us with a very quick and simple way to build flexible terrain. The quality of the elements is great, and the level of details is more than enough to give a body to the universe where our favorite characters evolve.Even a simple session of spray painting will get awesome result that will send your friends in awes. 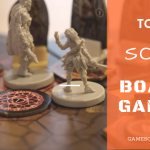 The price tag for the boxes is acceptable – for the price of a few minis, you can get yourself one of those sets, and for the dimension they bring to the table, I will possibly order a few more for my games. 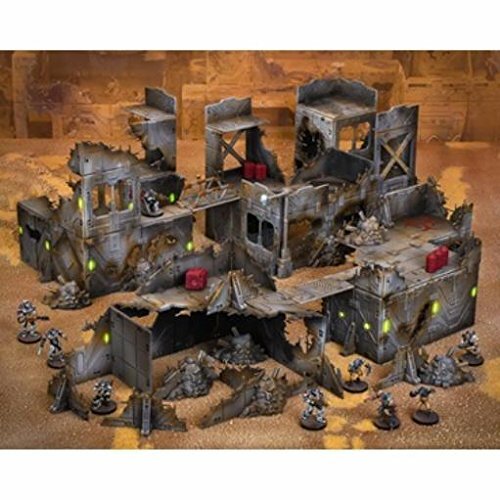 As a result, the forgotten foundry and the terrain crate ruined city will most likely be part of my zombie infested universes when my minis are ready to hit the table. From the different providers of terrain elements I tried, this one is my favorite so far.